Dutch-Bangla Bank Job Circular 2019 has published. Dutch-Bangla Bank Limited (DBBL) has published Job Circular for some important vacant positions at Dutch-Bangla Bank Ltd. Dutch-Bangla Bank Limited Job Circular 2019 is available my website. Banking career is all about choosing one’s own vision. So the interested and eligible candidates are requested to apply through online for the positions. To know more details please see the original Job Circular. Dutch-Bangla Bank Ltd Job Circular 2019. ■ Job Description: This job position is talented, the hardworking dynamic person for DBBL family of the position of Area Manager. ■ Compensation and Benefit: The Successful will be offered competitive compensation and benefits package as per policy of the bank. Dutch- Bangla Bank only shortlisted candidates will be called for written examination and invited for the interview. Any kind of persuasion/ canvassing in any stage of the selection process shall be treated as disqualification. Dutch-Bangla Bank Limited reserves the right to accept or reject any application without any reason whatsoever. 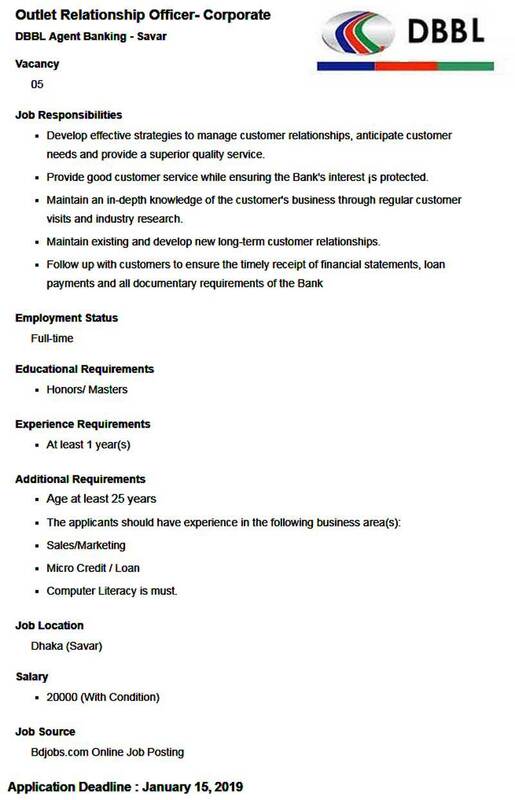 Dutch-Bangla Bank Ltd Job Circular 2019.